Be the first to share your favorite memory, photo or story of Valerie . This memorial page is dedicated for family, friends and future generations to celebrate the life of their loved one. VALERIE EDWARDS, wife of Daniel Edwards. 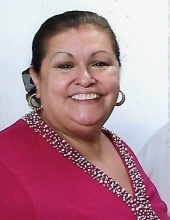 loving Mother of Jason and Craig Edwards; devoted daughter of the late Adalberto and Anita (nee Guiterrez) Barrios; dear sister of Petra ( late Juan) Camacho, Aurelio Barrios, the late Mona Barrios, the late Ana (Salvador) Suarez the late Felicia (George) Garza and the late Stella (late Paul) Vinas; fond aunt of many nieces and nephews. To send flowers or a remembrance gift to the family of Valerie T. Edwards, please visit our Tribute Store. "Email Address" would like to share the life celebration of Valerie T. Edwards. Click on the "link" to go to share a favorite memory or leave a condolence message for the family.